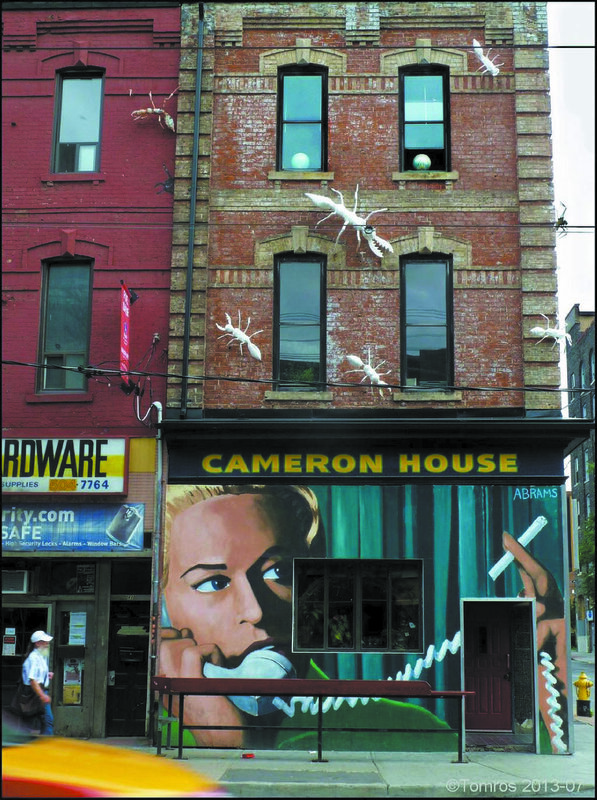 Growing up in Toronto, The Cameron House was one of the first bars I wanted to visit when I turned 19. The spray painted storefront was regularly redone, often displaying vibrant portraits of women that covered the entire exterior wall. When I finally walked in for the first time, I was a little overwhelmed by the excessive decor in such a small area. A strange array of plants — real and fake — crowd the bar itself, and plastic vines cover the ceiling above it. Posters line the walls that lead to a tiny stage, framed by red velvet curtains. It likely has not been renovated much since its beginnings as a music venue in 1981, which gives it a retro feel. Decor aside, what makes the Cameron so special is the quality music and relaxed atmosphere. No matter what day of the week, you are bound to stumble on some great local talent at the Cameron. From folk to blues to classic rock, at least two bands play every single night; the first starting at 6pm and the second at 10pm. Although the small size of the venue can make it hard to find a seat on busy nights, it also makes the setting more personal. Unlike several bars in Toronto, it’s not unusual for strangers to strike up a conversation at the Cameron. As the night gets darker and the cheers get louder, people might even get up to dance in front of the stage. One of the many things that make the Cameron feel so welcoming is the pay-what-you-can cover for the front room. A bigger, hidden room behind it requires a cover of around $10, but as a student on a budget, I’m always content staying in the quaint and cozy front room. The drinks are reasonably priced, but keep in mind that the bar is cash only, and the Cameron does not serve food. My Rating: 4 / 5. Tiny venue, good live music, and an opportunity to dance like nobody's watching. Whatever you do, don’t let the dingy look of the room turn you away. One beer and a couple songs in, I guarantee that the old, slightly cluttered space will start to feel lived-in and warm.